Silicon Nitride plays an active role in promoting faster bone fusion5. Silicon nitride was first prepared in 1857 and was little more than a chemical curiosity for nearly a century. However, things changed in the late 1940s when the compound began to be used across multiple industries, ultimately becoming a key component in electronics, turbo machinery, bearings, and even orbital satellites. It was discovered that silicon nitride is stronger than bone and PEEK, biologically kind (accepted by the humanbody) and produced artifact- free imaging. These promising findings led to the development of a proprietary composition of silicon nitride well-suited for medical device applications. At Amedica, we are the only company with the ability to manufacture interbody fusion devices from medical-grade silicon nitride. Silicon nitride has the ability to achieve superior new bone growth**. Along with antibacterial properties** and enhanced imaging attributes, the benefits are extensive. **Results are based on in-vitro and animal studies. Let our leading R&D and manufacturing teams convert your existing medical devices into silicon nitride. Our unique biomaterial is ideal for a wide variety of medical applications including spine, dental, hip, knee, extremities, etc. "Silicon nitride possesses qualities that promote clinical success." The surface chemistry and nanostructure topography of silicon nitride provide an optimal environment for stimulation of osteoprogenitor cells to differentiate into osteoblasts4. Silicon nitride implants are radiolucent with clearly visible boundaries, and produce no artifacts or scattering under CT and no distortion under MRI. This enables an exact view of the implant for precise intraoperative placement and postoperative fusion assessment3. 1. Gorth DJ, Puckett S, Ercan B, Webster TJ, Rahaman M, Bal BS. Decreased bacteria activity on Si3N4 surfaces compared with PEEK or titanium. Int J Nanomedicine. 2012;7:4829-4840. 2. Webster TJ, Patel AA, Rahaman MN, Sonny Bal B. Anti-bacterial and osteointegration properties of silicon nitride, poly(ether ether ketone), and titanium implants [published online ahead of print July 31, 2012]. Acta Biomater. 3. M. Anderson, J. Bernero, and D. Brodke, Medical Imaging Characteristics of Silicon Nitride Ceramic A New Material for Spinal Arthroplasty Implants; p. 547 8th Annu. Spine Arthroplast. Soc. Glob. Symp. Motion Preserv. Technol. Miami, FL, 2008. 4. Pezzotti, G. et.al. In Situ Spectroscopic Screening of Osteosarcoma Living Cells on Stoichiometry-Modulated Silicon Nitride Bioceramic Surfaces. ACS Biomater. Sci. Eng., 2  1121–1134 (2016). 5. Pezzotti G,et.al. Human Osteoblasts Grow Transitional Si/N Apatite in Quickly Osteointegrated Si3N4 Cervical Insert, Acta Biomater., 64, 411-420, (2017). **Results are based on animal and invitro studies. 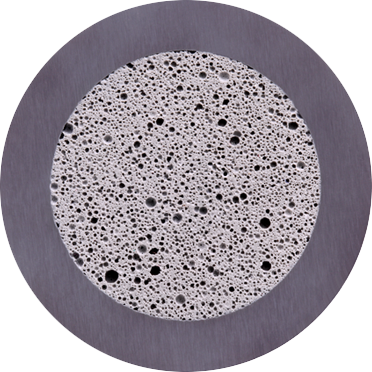 Our silicon nitride material features a unique nanosurface texture that inspires and promotes bone growth1, making it an ideal biomaterial. This innovative material offers more advantages than titanium or PEEK. 1. G. Pezzotti et.al. Bioactive Silicon Nitride: A New Therapeutic Material for Osteoarthropathy, Sci. Rep., 7 44848 (2017). *Artifact produced by tantalum markers. **Results are based on invitro and animal studies. Amedica has published many studies supporting the benefits of silicon nitride material. Amedica’s 30,000 sq. ft. ISO 13485 certified manufacturing plant in Salt Lake City, UT is the only medical device production facility in the world that produces CE marked and FDA cleared silicon nitride implants. The operation is vertically integrated from powder processing through to finished product and rigorous quality control. It has the flexibility to produce intricately shaped prototype and production components ranging in size from small dental implants to large articular femoral heads. Our proprietary composition of silicon nitride provides physicians with a strong biomaterial that is uniquely suited for spinal implants. We have an extensive portfolio of scientific data supporting the many benefits of silicon nitride for a variety of medical applications.